So, it’s been a long, long time since I’ve posted a new recipe on here, but I wrapped up the spring quarter and got to Berlin in one piece. Yay! While I’m still doing research work here in Berlin, my schedule affords me more time to work on blog posts and such. It’s currently 37ºC in Berlin, and the last thing I want to do is turn on the stove; so, without further ado: ceviche! I just made ceviche this afternoon (although the pictures date from an earlier version back in Chicago), and so I was inspired to put together this recipe while the fish marinates. This ceviche was made with corvina, but it can be adapted to nearly any sort of seafood by changing the marinating time and the contents of the marinade. Essentially, ceviche (also written cebiche and sebiche) is a marinated fish dish. What is distinctive about it is how the recipe blurs the lines between raw and cooked food. Raw fish (or other seafood) is cut into chunks or slices and covered with a marinade of citrus juice, along with other spices and aromatics. The acid in the marinade denatures the proteins in the fish and causes the same changes in texture and color that one would see with cooking over heat. 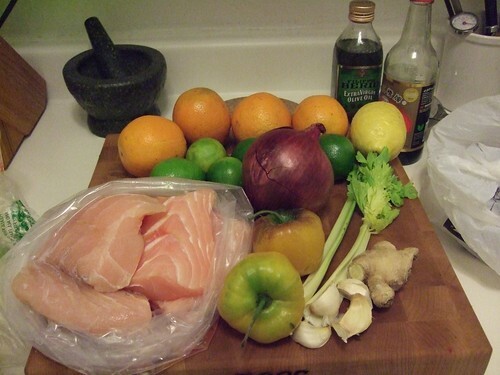 At its most basic, all you need for ceviche is: fish, acidic citrus juice, onions, and hot peppers. The version described here is the “classic” Peruvian version found along the coast (especially around Lima). This recipe features local Peruvian ingredients (e.g., ají mirasol) as well as the legacy of Chinese immigration to Peru over more than 150 years (i.e., the inclusion of ginger, called kión by Peruvians, which is a loanword from Cantonese). This recipe also features a blend of lime juice and bitter orange juice; in North America and Europe, bitter oranges only rarely appear in Latin American and Asian food stores (see the Tips section below for suggestions on how to substitute it with other citrus fruits). By the way, you can also check out an earlier version of this recipe posted to my first blog, Luis in Paris. The precise marinating time for the ceviche depends on the consistency of the fish and how you cut it up. If the fish is delicate (like sole or tilapia), it may only require a half-hour or so to cook, while heartier seafood (like tuna, salmon, or sea bass) need two or three hours. If you’re making something very tough like shark or octopus, you’ll need to marinate them overnight. If you cut the fish into small cubes or slices, the ceviche may be ready in a matter of minutes. 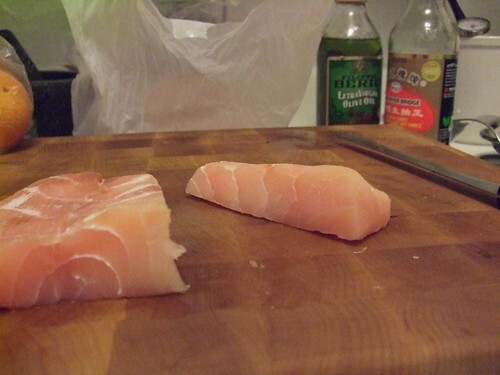 If you cut the fish into 1.5–2cm pieces (0.5 inches), you need to marinate for at least an hour, sometimes more. If you cut them into two-inch cubes, you’ll need two or three hours. If you cut them into very thin slices and then serve them just after the marinade has been added (i.e., nearly raw), you have tiraditos, a Peruvian-Japanese, sashimi-like relative of ceviche. NOTE: You’ll notice that, in the pictures and instructions below, I cut the corvina into very large chunks and then only marinated it for an hour. This is because I like my ceviche to be a little raw in the middle. If you want your ceviche fully “cooked,” be sure to cut the fish into smaller pieces or to marinate it for a longer period. Ají mirasol (peruvian yellow hot pepper) can usually be found in most Latin American food shops, either frozen or canned. You can also find it molido (i.e., ground into paste). Ají rocoto is a little bit harder to find, but it is sometimes sold in Mexican shops with under the name peron or locoto; you can recognize it by it’s round shape, thick flesh, and black seeds. If you can’t find these hot peppers, you can replace the ají mirasol with medium-spicy peppers (e.g., jalapeños) and the ají rocoto with rather spicy ones (e.g., thai chilis, habaneros). Bitter orange (naranja agria) is really hard to find. Look for it in Latin American or Asian shops. Some shops may keep the oranges frozen in the back (since demand for them is rather low and they are very perishable), so it’s worth asking the staff. If you can’t find bitter orange, try to find sour or unripe oranges and then just increase the proportion of lime juice in the marinade. 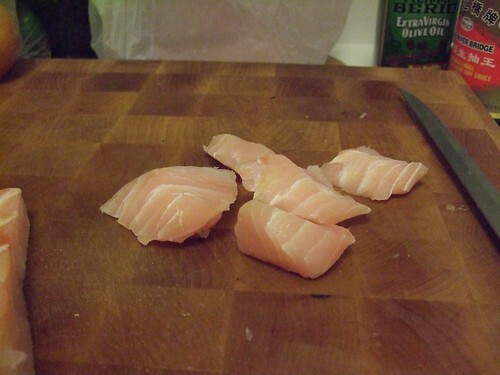 If you have trouble finding a “typical” ceviche fish, such as corvina or sole, select a white-fleshed fish with relatively tender flesh (e.g., Northern Pike, cod, orange roughy). Swordfish is also excellent, but requires longer marinating. a storage container for marinating (either a cover for the bowl or a gallon-size, zip-top freezer bag). 1. Wash the fish in cold water and pat dry with paper towels. Put aside while you prepare the marinade. 2. 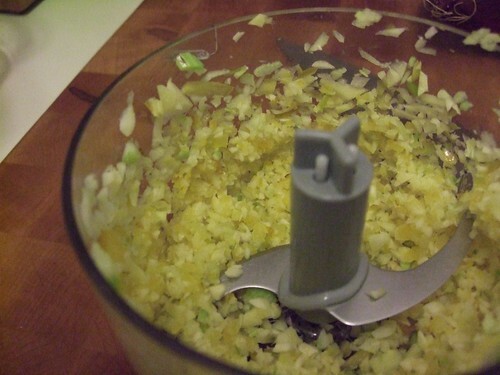 Dice the ají mirasol and the garlic finely; grate the ginger. Add to bowl. NOTE: In this photo, I took a shortcut and put all three into a hand-blender attachment to dice quickly. 3. 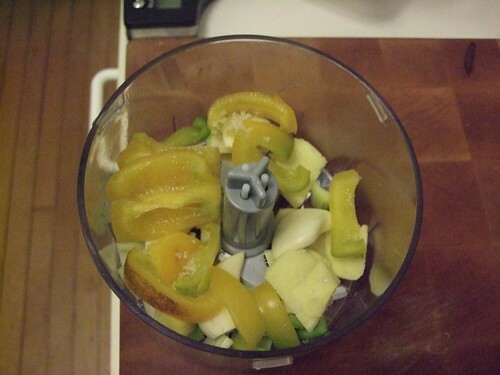 Squeeze all of the citrus fruits and add to bowl. Mix. 4. 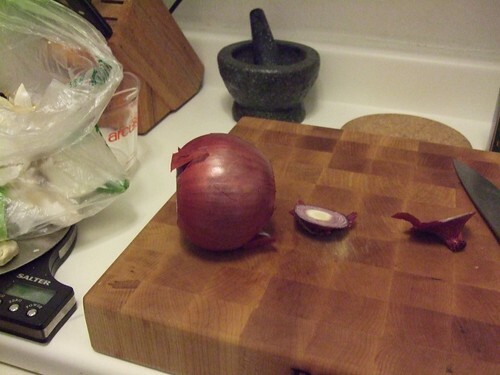 French-cut the onion. 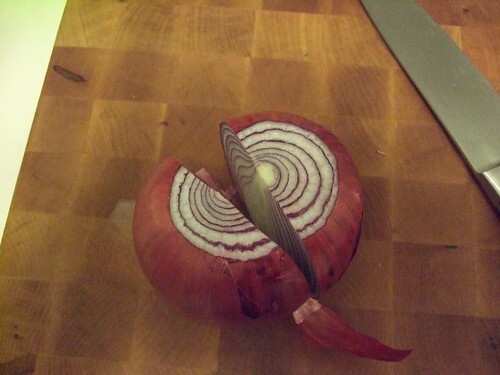 Cut off the top and bottom of the onion and peel. 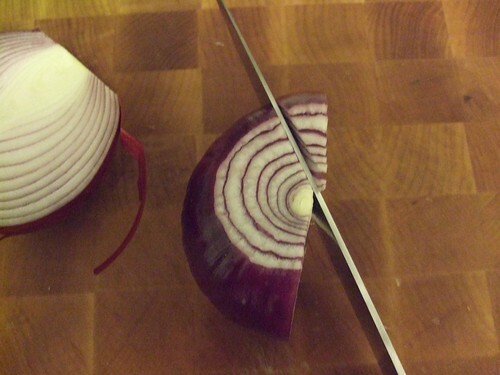 Then, cut the onion in half lengthwise. 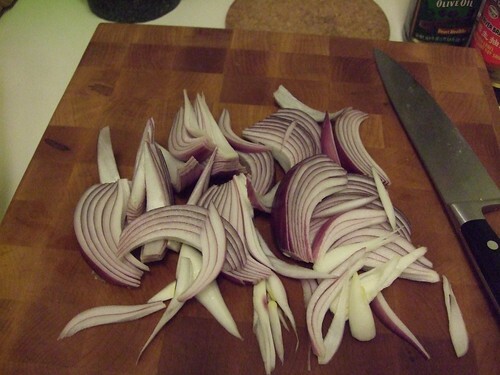 Cut the onion lengthwise radially around the center (see images below). 5. 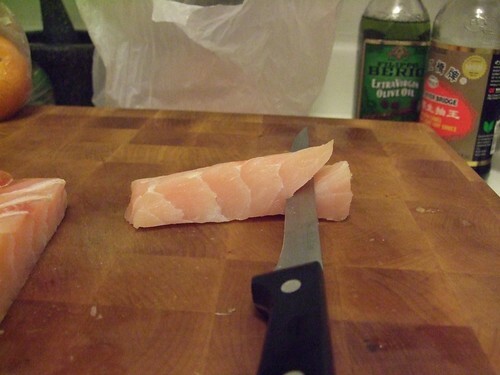 Cut the fish into cubes or slices. 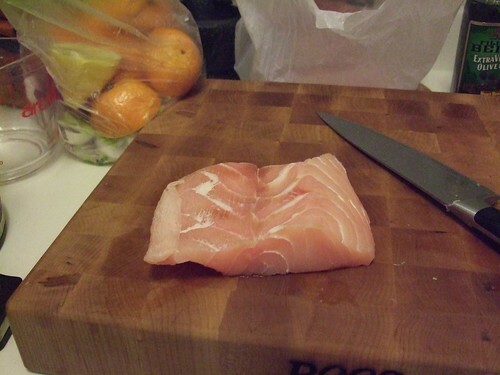 Try to cut across the grain of the fish’s muscle groupings, which will make the pieces more tender after marinating. 6. Mix well, cover, and store somewhere cool for at least an hour. 7. Just before serving, mix in coriander and slices of ají rocoto. Serve.